This family name identifies the uncompromising care in the vineyard and cellar technology. Optimum harmony between growth and harvest, only a fully ripe harvest and balanced maturity are the requirements here. Amistar is a philosophy - it begins in the vineyard and matures in the enjoyment of a glass. Vine variety: 30 % Pinot grigio, 30 % Sauvignon blanc, 40 % Chardonnay => this selection is a vintage cuvèe and contains about 5 % dried grapes (dried on the vine) and the Chardonnay matures for 8 months in french oak, where Gewürztraminer and Sauvignon blanc have to develop on the fine yeasts in stainless steel vats for the same time. 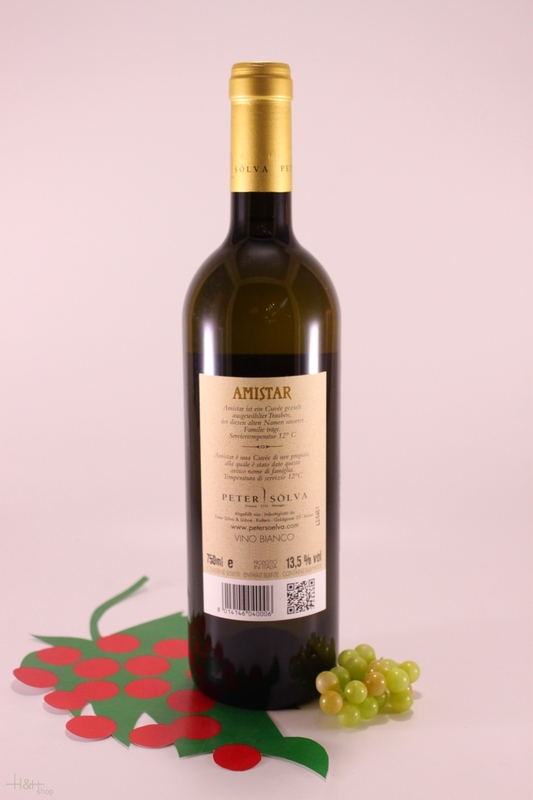 Description: This is a special white wine cuvèe with an intense aroma and palette. The aroma reminds one of dried berries, exotic fruit, honey and is supported by wood. When drunk we find a versatility between minerals and body and continuing structure. Position: Grapes several locations. Sarapan von Tramin, Puiten von Caldaro, Lafai Girlan. Land: The land goes sandy to stony chalk land. Harvest: Various harvest times between the end of September and the beginning to middle of October (= dried grape harvest) because of the different locations. The Amistar concept requires a minimum of 19.0° KLM. Development: White wine pressing. Depending on the variety and ripeness, a short standing period is carried out after mechanical removal of the stems (maceration). Then the mash is pressed and the must is left to stand in a stainless steel tank for natural clarification for one day. With this cuvèe the must is first of all separated into individual varieties and fermented in barriques at controlled and, in particular, cool temperature. After fermentation is completed the individual quantities of the various vines are reassembled and stored until maturity in barriques for 8 months. Serving temperature: 12 - 14 °C recommendation > decanting. Food recommendation: It is very important that this white wine cuvèe is only served with certain dishes. It is very suitable for Asian dishes, and particularly also for spicy dishes and for tasty or intensive fish antipasti respectively. We particularly recommend a combination with goat's chees or in particular to a Robiola (Tree Latti -goat-sheep-cow cheese ) with a little fig mustard.